A BRAND-new show choir is bringing smiles to the faces of its audiences. Burnt Mill Academy, in Harlow, has launched the performance choir to breathe new life into performances by encouraging singers to move and dance as they sing. 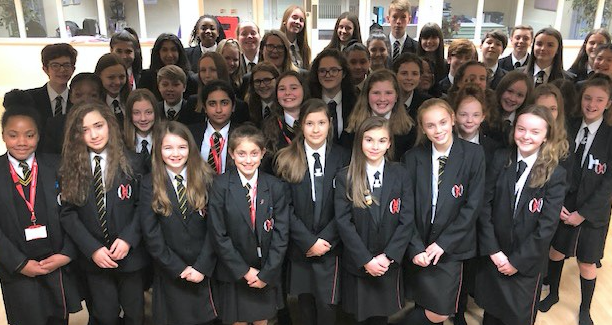 The choir first performed at the school’s Christmas showcase and has since taken its new style of performing to all staff during whole school briefing. Mrs Casey said: “They felt the words and brought them to life; they are bringing their passion to their performance. They were so proud to share their voices with their teachers. So many members of staff have told me how much it made them smile. It brings a bit of warmth to the heart. The choir also performed for a full house at a charity event at the Harlow Playhouse. We were very lucky to be invited to this event. Most of the 70 students attending were performing on this stage for the very first time. “It’s about performance with interpretation; that’s what every musician is aiming for. It’s not about just opening their mouths and singing; they are learning performance techniques and how to project their voices. We see this new confidence in every student from the moment they walk on stage. “Children who might have felt stress previously are no longer stressed. It’s giving them a sense of purpose and motivation, as well as developing their confidence. They get a sense of belonging, community and wellbeing through being a part of our choir. It is hoped the choir will soon take their performance on tour.